The Luxembourg Centre for Systems Biomedicine utilizes Re-scan Confocal Microscopy in their research into neurodegenerative disorders like Parkinson’s and Alzheimer’s Disease. The Luxembourg Centre for Systems Biomedicine (LCSB) is a multidisciplinary research institute that aims at understanding human health conditions with a special focus on neurodegenerative disorders like Parkinson’s and Alzheimer’s Disease. To that aim, they study model systems as well as patient-derived samples at multiple scales, from individual molecules over cells and tissues, up to the whole organ and organism level. The LCSB is home to more than 200 scientists with diverse backgrounds ranging from the different disciplines of biology, neuroscience and medicine, over engineering and computer science to theoretical and applied chemistry, physics and mathematics. This broad mixture is at the core of the institute’s original approach and successful studies of neurodegenerative disorders. Research Associate, Dr Aymeric d’Hérouël, describes how he uses microscopy in his research work. With its high resolution, confocal microscopy is an essential tool for the study of structures and molecular interactions or spatially resolved gene expression in tissue samples and cells. A typical application for us is the fluorescent labelling of entire cells or sub-cellular structures, followed by 3D-scanning with confocal microscopy, comparing patient and control samples with the aim to unravel disease-causing mechanisms. 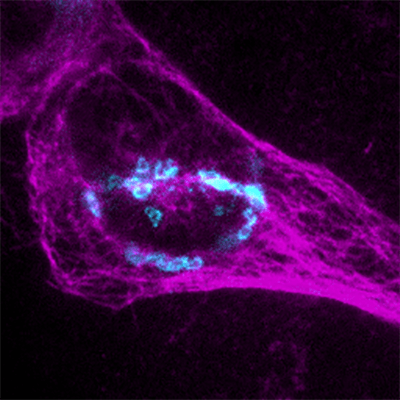 Another application is the imaging of live neuronal cells, in which specific organelles are labelled with fluorescent dyes, e.g., mitochondria which play a central role in neurodegeneration. Doing this with a confocal microscope allows Dr d’Hérouël and colleagues to study the behaviour of the labelled organelles in disease models as well as in cells subjected to genetic mutations or environmental stresses. Dr Aymeric d’Hérouël (LCSB) coordinates the bio-imaging platform here featuring the RCM module (orange) from Confocal.nl. A screenshot of a typical work session: RCM-supported study of Alzheimer’s Disease patients’ post-mortem brain samples. In the central window: Reactive astrocytes labelled for GFAP (red), activated microglia labelled for Iba1 (blue), and Thiazine red-labelled amyloid-β plaque (amorphous structures, red and blue).